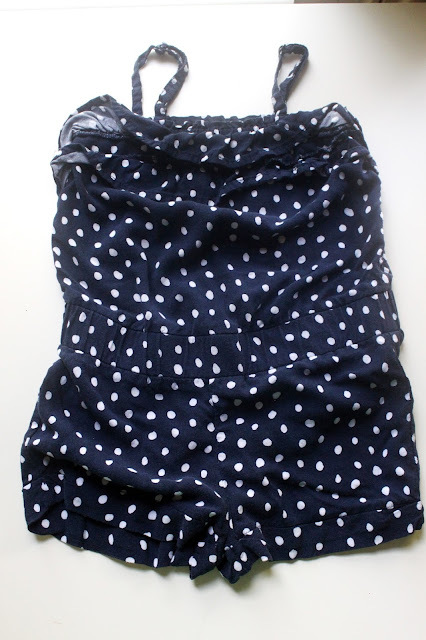 Rompers are super adorable and very in style right now, but if you own a romper, you can attest to the fact that it's not exactly ideal to strip down to your birthday suit just to go to the bathroom. It's especially bad for little girls, like my daughter and niece, who aren't able to dress themselves quite yet. I mean, you'd think that there would be snaps on those things to help out the kids at least, right? SUPPLIES: romper, scraps of fabric for snaps (I cut some pieces from an old knit t-shirt), snap kit and snap setter (or sew-in snaps if you don't own a snap setter), sewing machine or needle and thread, seam ripper, tape measure, iron and ironing board. ONE: first, use your seam ripper to carefully rip the stitches in the crotch area where the snaps will be sewn. 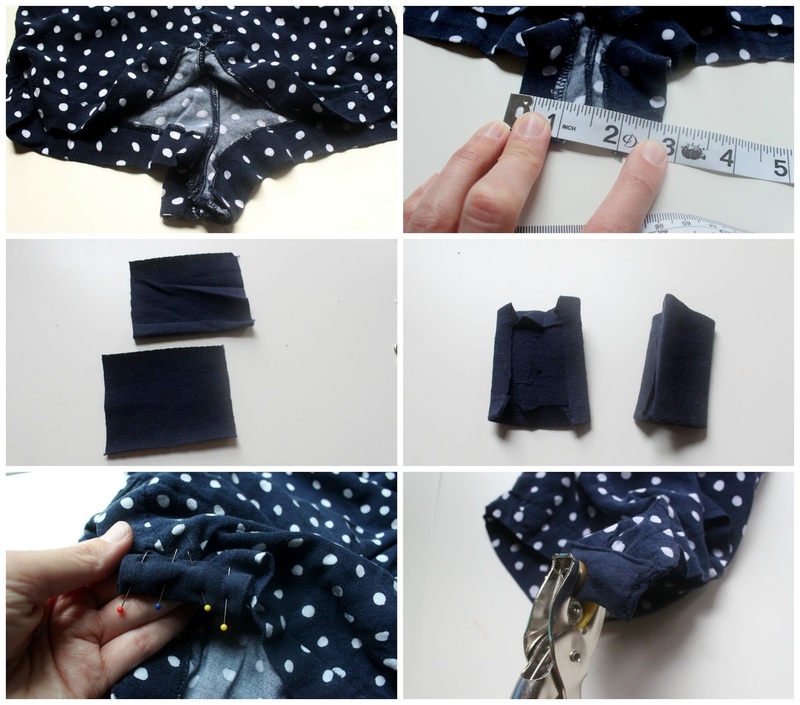 TWO: next, use your tape measure to determine how wide to cut your fabric for the snaps and add 1/2 inch. My pieces ended up being 3 inches x 3 inches. THREE: cut out two pieces of fabric in the dimensions noted above. 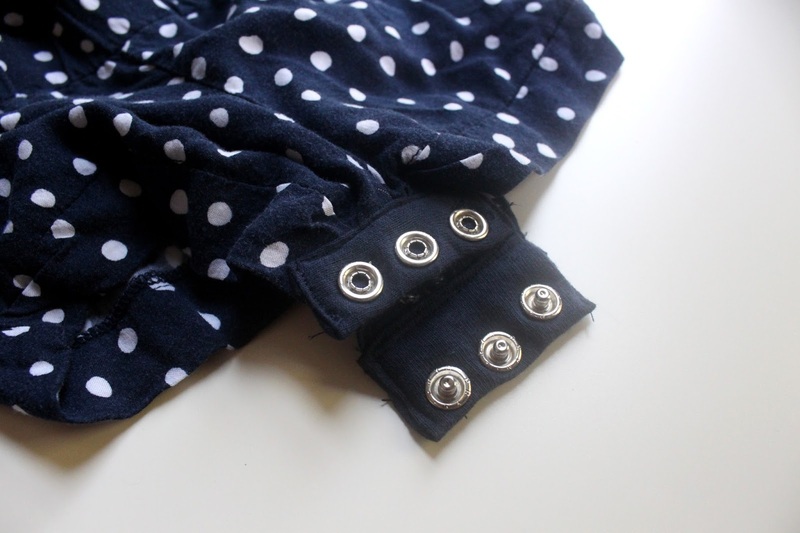 FIVE: encase the raw edge of the crotch area in your fabric piece and pin all around. Sew to secure. Repeat for the other side. SIX: finally, follow the instructions on your snap setter to attach your snaps. Yay for snaps and for no more awkward bathroom moments! looks nice!! great detail design!! do you have to have one of those tools? Thank you for sharing this! What a wonderful idea! This is like the best thing ever! Really who doesn't want to add snaps to like everything for their baby. It is a great idea! Thanks for sharing! Do you have any tips for setting grippers (snaps)? I've never had much luck. The last tool I tried had no way to line the teeth up with the groove. Your instruction to "attach your snaps" makes it sound so easy which, in my experience it's not. What brand tool and grippers do you use? And, yes, a maidenhair fern, you do need the tool to set the grippers -- and the tool and grippers must be compatible in size and brand. I love this-- especially since my little is not out of diapers yet. 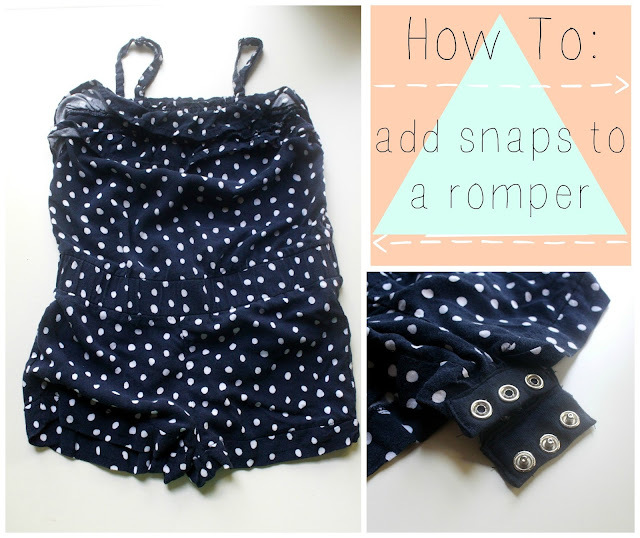 I featured this on Sewistry-- you can find the link here: http://sewistry.com/2013/09/add-snaps-to-a-romper-sewing-tutorial/ ! Thanks! Thank you for the wonderful, simple tutorial. I just did this with a Gryffindor bodysuit, and it was an easy project. I'm 5'9", so bodysuits tend to be too short for me. So I made the tabs act as sort of "extensions" for the bodysuit. Now, I have snaps, and the bodysuit is long enough for me!